This entry was posted in Restaurants and tagged Istanbul, Turkey by Hilary. Bookmark the permalink. 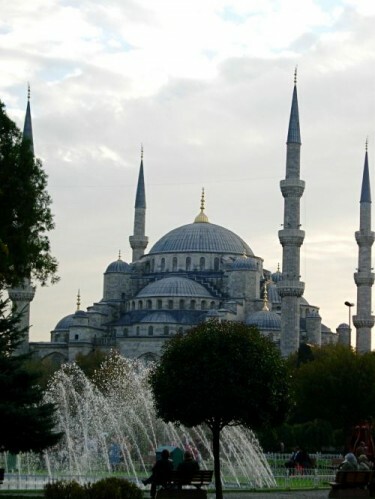 We did an organised tour of turkey which included a one day tour of Istanbul. At least three days is needed. The food, the people, the place and ahhhh! the apple tea. We will return. I highly recommend Chez Vous restaurant in the Beyoğlu area on “French Street”. The cook/owner has celiac disease so she completely understands the issues. Also, she sometimes has gluten-free bread. In addition, the food is excellent and a little different from the traditional Turkish fare. It is still Turkish, but with a little added flair. All in all, a wonderful experience. I just wanted to write to say thank you! I have a long long list of allergies, the most prominent being gluten. Not only have I scoured your pages for restaurant recos in Istanbul but the Gluten Free celiac card has been one of the biggest ‘finds’. On the back, with help from google translator, I’ve been able to make tiny laminated cards to keep with me so I can keep myself safe! One of the biggest questions I get from my friends and family about my travel is “Aren’t you afraid of getting sick?” and with help of wonderful people like you that I can leave home and venture out into the world feeling empowered to eat at restaurants where they may not speak English. Thank you for blogging and providing such amazing tools to help others. my wife has Celiac disease,we had very problems. Thank you SO much for the Intel. I have very severe celiac. I’ve used the cards when in Paris. Relieved they are available in Turkish and Greek!